A few years ago, I posted a picture of a small blue ribbon with a heart charm saying that I was hoping to add these to the memory boxes. Until now, I’d not been able to include them due to the frustrating process of finding an efficient means of assembly for the pins and the need to design a card to hold them. I’m pleased to announce that we will now be including the ribbon pins in addition to the mother’s bracelet! As the picture above shows, there are three ribbons. The top one is just simple bow with a heart charm and is meant to be left with the child, perhaps in their tiny, precious hand. The bottom two bows are pins meant to be worn by the parents and/or family members. One has a tie tac back and one has a bar pin back. We will be providing blue and pink ribbons, as well as white ones for the gender neutral memory boxes. I hope that these will provide a simple, yet meaningful, way for the the parents and family members to keep a connection with their lost child. In the future, I hope to be able to provide a miscarriage version of the pins. The loss of a child through miscarriage is still the loss of a child. Here is an example of the miscarriage pins. Next, I will be working on instructions and kits so that I can recruit other people in the assembly process. Hopefully, that process won’t take me another three years! Thanks to the amazing generosity of Melissa Muir (http://www.kcjewelbox.com/main.sc), I am happy to say that there is a new addition to the memory boxes! This adorable angel. I’m always in search of something special to add to the boxes. These are perfect for so many reasons. They can be worn on a chain as a necklace or as a pin. Hmm…this makes me happy and sad at the same time. Happy that I’m able to provide these to people who need them and sad that there are so many people in need. I’ll be taking twenty-eight memory boxes to Carle today at lunch. 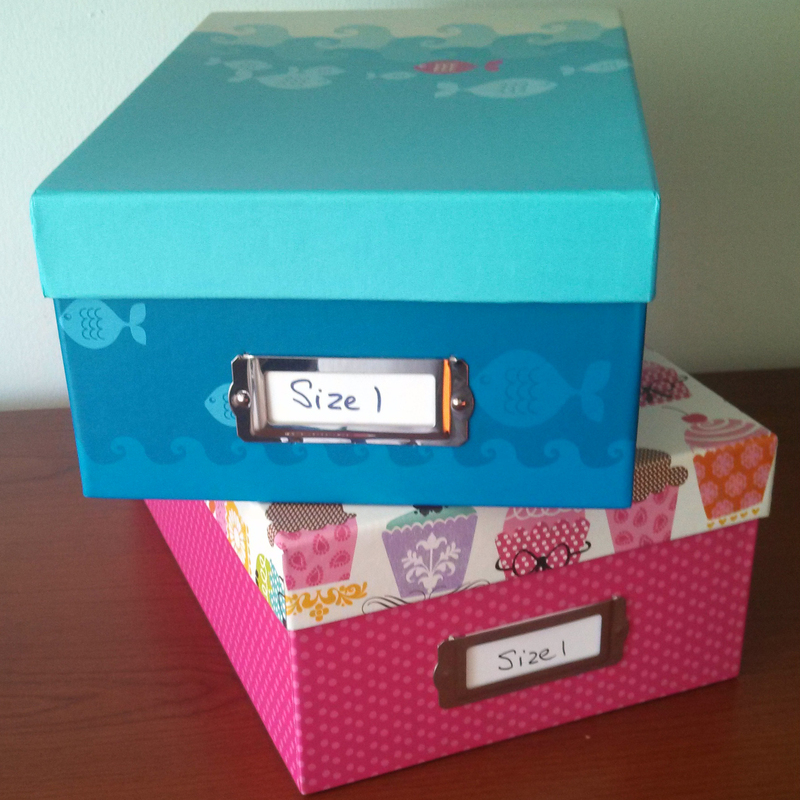 Here are a some pictures of the contents of a size 1 memory box, in both genders. Size 1 is the smallest gown that Threads provides. Each size 1 gown is about 10.5 inches long. The gowns are closed with a soft velcro and can be drawn tight with the ribbon at the wrist and bottom hem. The picture below includes one of the tiny flannel diapers which I hope to include in all future memory boxes. I’m always in the market for a new and/or better idea for things to include in the memory boxes. One day, I ran across an idea of doing a simple ribbon to accompany the mother’s bracelet. The original idea came from a post made on the Angel Babies site. They did a mother’s bracelet and either a small bracelet for the baby or a ribbon with a charm. I really liked the ribbon idea. Here is a picture of the first ribbon that I made. It is made with 3/8 inch wide ribbon and is about 1.5 inches wide. I’m thinking about replacing the bracelet with a set of these ribbons. There would be either two or three of the ribbons. One could be placed in the baby’s hand. The other one or two would have a pin on the back and could be worn by the parent(s). The theory is kind of like the black crepe bands that were worn to show that someone was in mourning or the ribbon “awareness” pins. I found the pattern for this tiny little burial wrap on the Angel Outfitters website. It comes in two sizes: Small (up to 6″ or 14-16 weeks gestation) and Large (up to 9″ or 17-19 weeks gestation). I wanted to use a plush material for the inside so it would be super soft. 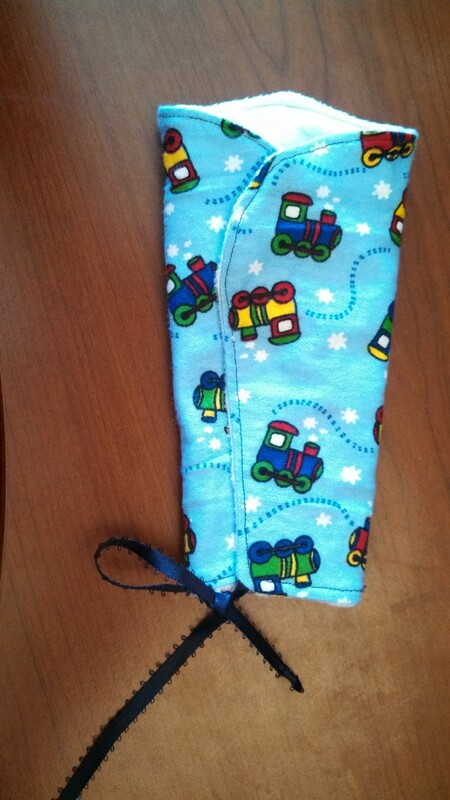 I used a white “minky” material, which made the wrap too stiff to cinch with a ribbon at the bottom. So, after a couple of tries, I decided to sew ribbon into the seam at strategic locations so that it would tie closed. This design does leave the bottom open instead of closing it up like it would if you cinched it. I suppose that if this was a real problem you could try using a safety pin (which I had trouble getting to go through the minky material since it is pretty dense stuff) or attach a small amount of velcro. Below are a few shots of the completed burial wrap in the small size.